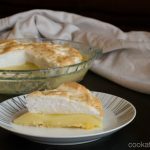 This lemon meringue pie is an awesome recipe, but one that I generally only pull out for special occasions. It’s not that it’s difficult by any means. Or even take up a lot of time to make it. It’s just, I don’t know, special and if you do special things to frequently, they lose their special-ness. Maybe? Anyway, this is really tasty, with just the right balance between sweet and sour, tangy and yummy (although I don’t think that tangy and yummy are antonyms by any stretch of the imagination). 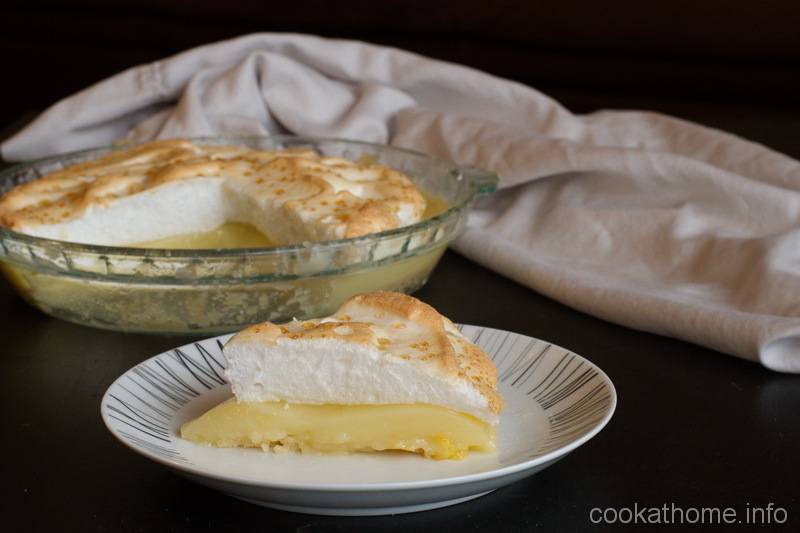 Use the ugly pie crust (recipe here) as a base and cook it before you start making the filling. And it works best with fresh lemons, even though that’s a little more effort. I’ve also used just bottled lemon juice and it works well, just without that added ‘pizzazz’. Prepare and bake the pie crust according to directions, or simply use a store-bought crust. Allow to cool. Combine the sugar and tapioca starch in a saucepan and set aside. Combine egg yolks, water and lemon juice and stir into dry ingredients. Remove from heat and stir in butter and lemon zest. Combine 2 tbs sugar with tapioca starch in a small saucepan and add water. Cook over medium heat, stirring constantly until mixture is thick and clear. In a separate bowl, beat egg whites with vanilla until soft mounds form. Add remaining sugar gradually, beating well after each addition. Add hot mixture and continue beating until meringue stands in stiff peaks. Bake at 350F for 12-15 minutes until golden brown.